- I am just updating this post as I see that despite kind requests these photos have been posted to Pinterest so I sadly submit copyright forms to their HQ. If someone from Pinterest would kindly like to explain I would be very interested. Please don't be shocked by these bags - I may have mentioned before that some women have lots of shoes whilst I own only two pairs of shoes (not counting the ones for the 1930s and 40s that my bunioned feet can no longer get into....) and they are falling apart. I do not have many shoes but I do have one or two bags....these are not all of my bags.....there are some more......bags are used all the time for Co-op shopping.......bags cheer up a day...........bags cause an admiring glance now and again (funnily enough my shoes do not have that same effect....). |I will not be photographing my shoes............I like bags.........do you like bags? I love bags too! Do you recommend any particular pattern? No sunshine here, sadly, all grey and dull and in fact started raining a few minutes ago, I can hear it falling on the conservatory roof. Oh joy. Funny just last night I was browsing through your Flickr photos and getting lost in all those beautiful embroideries. I didn't deliberately go to your photos, by the way, I was looking for a chap that does amazing things - stuffed animal sculptures mainly - with vintage embroideries and Google led me to your Flickr set. It wasn't what I was after, and I never found the man's website, but I got drawn into your photos and spent ages and ages admiring your things. I always do, when I visit your pages. Lovely things. Thank you wendz - so you found flickr there are one or two (thousand...) photos of mine there I think so I dip into them now and again to furnish my blog. Sometimes when I too am Googling something I spot a something and then realise that it is my own!! 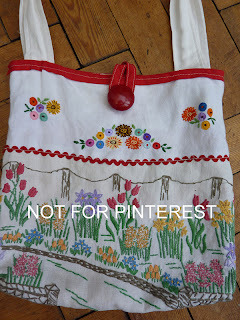 I'm with you on zipped purse - easy to make and simple to use!! The bags are very nice and no need ever to apologise for having so many lovely ones but really, what I am most drooling after is the wallpaper! I like bags. Much more than shoes. Although shoes are nice, I like bags. I don't think I have quite as many as you and my style is different but I do like the tapestry one with the birdies. It's awfully nice! I hide my bags away in wardrobes and boxes but yours are too pretty to be hidden. You ought to go and treat yourself to some new shoes! 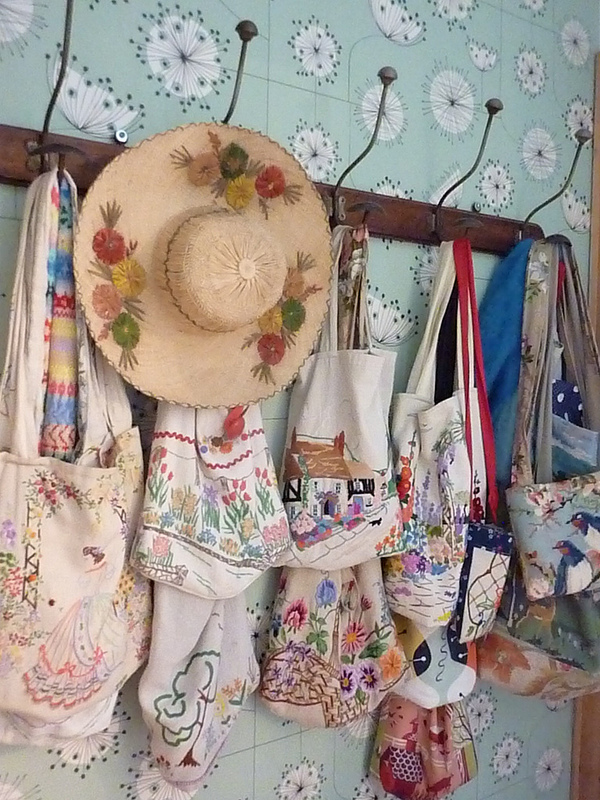 Lovely bags. Especially the birds. Thank you Missy - that bird bag is my current daily use bag, I made it two or three years ago and it was from a car boot (for 50p) but the bottom part was damaged - I particularly like it because I lined it with vintage embroidery so extra nice to look inside! I will buy new shoes this summer - it really is at danger level shoe wise! I like bags, particularly your embroidered bags, of which I have just one, so far. Like Hen I love that wallpaper too! 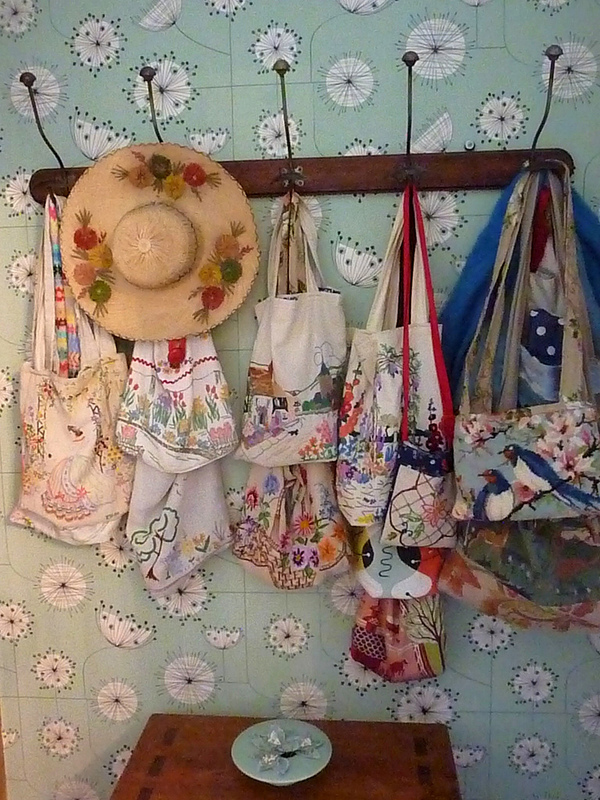 I absolutely adore your bags, I have never seen more beautiful bags. I have some lovely old embroidered tablecloths and really, to use them like this would be a wonderful thing as I rarely use them. 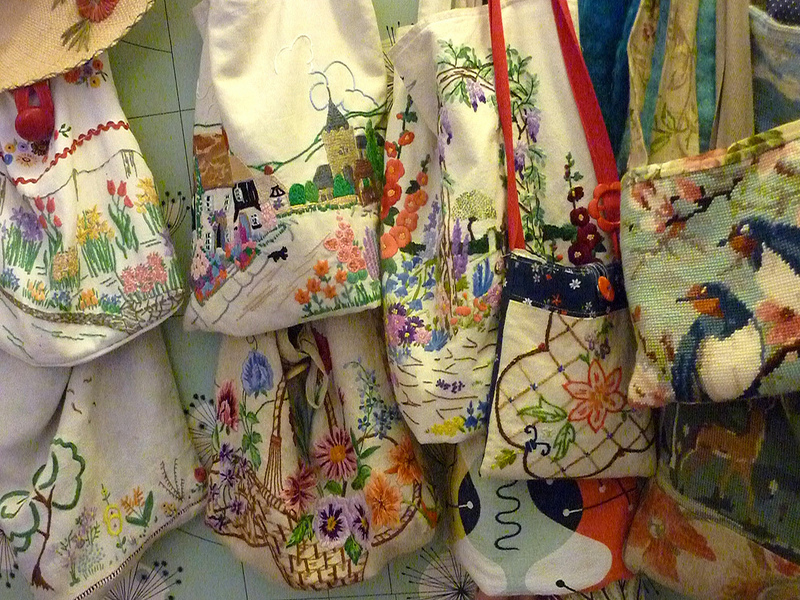 Thank you The Sea Garden - I use damaged and worn tablecloths for small bags in particular or cathedral window patchwork (that I am particularly fond of making). I make no secret of the fact that I am partial to an embroidered tablecloth...I have a few..
​I was overwhelmed in the good sense. I cant find a sentence which may describe my excitement and pleasure - I prefer to use singular sounds 'ahh' 'oohh' and 'lovely'! I do feel most privileged to of encountered the Specialised Seasonal Decoration storage! It beat my mother using Economy sized nappy box's from the 1980s to store the precious delights in the loft! Its only shows your appreciation and affection to them!